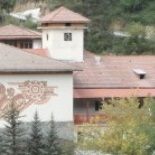 The orphanage Shiroka Luka opened its doors on 1 September 1968. It is located in the most beautiful part of the Rodopa Mountain, only 10 km away from the popular touristic area Pamporovo. Shiroka Laka is a historic and ethnographic architectural reserve with long traditions in the celebration of cultural and educational holidays. Close to the orphanage is also the National School for Folklore Arts, a clinic for the children and a full-day kindergarten and pre-school facilities. In the home live 60 children in the age between 7 and 18, that is its full capacity. Children and youngsters can stay there until they finish their secondary education but not after they turn 20. They are divided in three groups of permanent care and three groups of weekly care. A dedicated well trained team of 23 people takes care of the kids, consisting of a social worker, a psychologist, a therapist specialized in labor questions, a paramedic and a volunteer from the Peace Corps (USA). The team works according to an institutionalized project signed also by the municipality of Smolyan that defines the direction of development and the vision of the orphanage. The vision of the home is to become a pillar and trusted partner for offering high quality services for children without parents that are in line with the European standards. The attention and efforts of the team are mainly directed to developing social competences with the children and protecting them from the sources of traumas and stress. At the orphanage there is a well-equipped room with 10 computers with internet connection. Here the children developed their computer literacy and English skills. The children and youngsters live in five apartments. All bedrooms are furnished with beds, night tables and wardrobes for each of them. The walls of the bedrooms and corridors are isolated and have hanging ceilings, the floors are covered with laminated parquet. The electrical installation and lighting in the whole opphanage were recently renewed. Every apartment has its own bathrooms and toilets.